Malta’s biggest event of the year is back and it’s called the Malta Poker Festival! From Nov. 1-6, the Portomaso Casino in Malta’s vibrant hotspot St. Julian’s will set the stage for six days of exhilarating poker action, as well as host a slew of great off-the-felt activities to complement the perfect poker getaway to the Meditteranean isle. The Malta Poker Festival has been founded by the former organizers of the Battle of Malta, who parted ways to embark on something new and exciting. 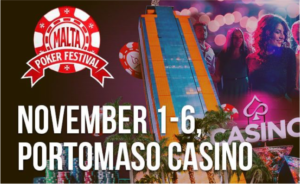 The Malta Poker Festival follows in its predecessor’s footsteps and will return to the Portomaso Casino, where the event grew into enormous proportions over the past seven years. Last year, a staggering 2,074 entries were made in the Main Event, with Nadav Lipszycstanding tall over the bumper field and turning his original investment of €550 into a payday of €200,000 ($232,585). Daiva “Baltic Blonde” Byrne, Steve Watts, Andreas Hoivold, Jesper Hougaard, Ivo Donev, and Pat Savage from the Pat Savage Band and Netflix show “Savage Roads” are among those that have already confirmed their attendance for this year. The €550 Malta Poker Festival Grand Event is the highlight of the series and runs from Nov. 1-6, including three starting flights with room for 700 players each. The Grand Event boasts a guarantee of €500,000, ensuring much value for the affordable price tag. A single re-entry is allowed for each starting flight. On Sunday, Nov. 4, survivors from the three starting flights will return to play Day 2 together. The inaugural champion will be crowned on Tuesday, Nov. 6. The festival sports several other events such as the €1,320 Grandmaster High-Roller on November 3-4, as well as the brand-new €220 Hendon Mob Championship on Nov. 4-5. Besides The Hendon Mob, the Malta Poker Festival partners up again with their old stalwart, the Israeli Poker Tour, as well as the APAT. Both of these series will have their own tournament featured during the series as well. A special €100 MPF Ladies Event will take place on Saturday, Nov. 3 at 4 p.m. Learn more about the unique Ladies Event on PokerNewsin the near future. PokerNews will be on the floor daily to cover the Grand Event start-to-finish. “The Grand Event’s opening should not be missed!” Montealegre smiled, hinting at something special at the start. Known for its activities off the felt as much as in the poker room, the Malta Poker Festival keeps its tradition of offering its players a wide variety of amenities to make their stay on the Mediterranean party island unforgettable. A great opening cocktail party and a special MPF VIP Player party are part of the packages the festival offers its players. Click here for more information about the available packages for the Malta Poker Festival. To buy-in directly for a full package or a seat only to the Grand Event, click here. Tournament schedules are located here.